← Have You Considered a Curved Deck Design? A deck for the patio is always a welcome option. However, have you considered a deck for the second floor? Aside from a more charming home, the benefits of a second-story deck are aplenty. This is a major renovation that will immediately pay itself off. The most obvious benefit of a second-story deck is the additional living space. You acquire more in-home roaming space without taking up extra space in the floor below. Plus, don’t you think it’s just plain cool to have a barbecue on a balcony deck overlooking the neighborhood? This would be an exceptional setting for a social gathering. 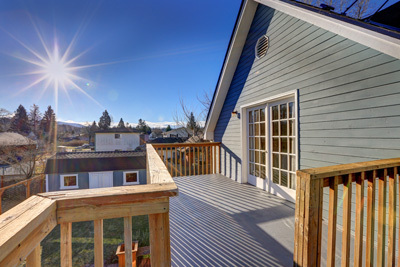 Also, should you ever sell the home, a second-story deck is one amazing selling point. Assuming the deck meets building codes, the structure should also raise the property’s value. With a deck on an upper floor, you also have more expansive decorating options. This goes for both the deck and the space directly below. For the deck, we recommend a pergola or rails that match the exterior color and texture of the walls. This helps the deck blend with the structure as a single unit. For the space below, don’t just let it be bare, with nothing but a patch of grass or concrete. The spot can be equally inviting and usable by adding a distinct set of patio furniture. Consider a set of wicker or ottoman chairs and a small tea table wedged between raised garden beds. Give Allied Construction a call to enquire about your decking options. See our gallery for inspiration. An upper deck, along with a fence to go with it, would be an exquisite exterior renovation. The benefits of a second-story deck make this an idea worthy of contemplation. Posted on March 28, 2018 under in Roofing Tips | By ignite.